Oh yeah!Back with this week Developer hub containing News ,Recommended tools for the developer. We try to pick up those tools and apps for designers and developers that are genuinely worth checking out and promise to make you all feel glad about having found such stuff that are created with the clear aim to help you out wherever you get stuck. Last month's Android platform distribution numbers showed a continuing steady rise of Android 4.4 in handsets worldwide, but this month's numbers mark a major jump - KitKat is up to 13.6% of all devices. There's a lot of buzz surrounding the possibility of using NFC-enabled smartphones to replace transit smartcards. The introduction of Host Card Emulation for Android (standard on OS 4.4 KitKat) is starting to fuel the development of many applications that could be used for mobile payments, access control, and smartcard emulation. Google Play services 5.0 is now rolled out to devices worldwide, and it includes a number of features you can use to improve your apps. This release introduces Android wearable services APIs, Dynamic Security Provider and App Indexing, whilst also including updates to the Google Play game services, Cast, Drive, Wallet, Analytics, and Mobile Ads. A few weeks ago, Roman Nurik and Timothy Jordan were chatting about designing apps for wearables to validate some of the content they’re planning for Google I/O 20141. Here a post about everything they did to design an wearable app from scratch. Emojicon is an Android library to implement a TextView that supports emoji. Goro is an Android library for organizing your asynchronous tasks in queues. A PageTransformer for ViewPager that provides a parallax effect. A useful shell script that wraps Android adb commands when multiple devices or emulators are connected. The script will prompt for a device or emulator to run the command against, if it detects multiple devices / emulators. 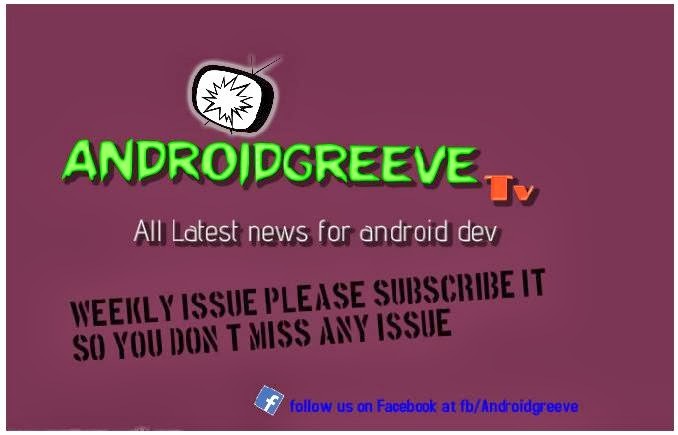 Great News,But Missed the previous one no problem Check out the previous News Here is it Android Developer News you shouldn't miss .But why miss if you can get the update straight to your inbox. Just subscribe and get update week.